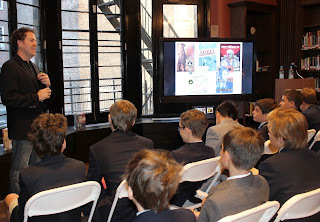 On Monday, our seventh and eighth graders were treated to a visit by Steve Sheinkin, the author of several award-winning historical nonfiction books for young adults, including Bomb, Lincoln’s Grave Robbers, Most Dangerous, and The Port Chicago 50, which was on the boys' recent summer reading selection list. Mr. Sheinkin spoke of his early efforts to forge a career as a filmmaker and, after that, how his tenure as a textbook writer piqued his interest in writing nonfiction about little known stories from American History. The boys were fascinated by the subjects of his books, and his writing and research process, particularly how he organizes all of his research. As Upper School Librarian Gwen Kaplan noted, "We were all sad when his time with us came to an end!" 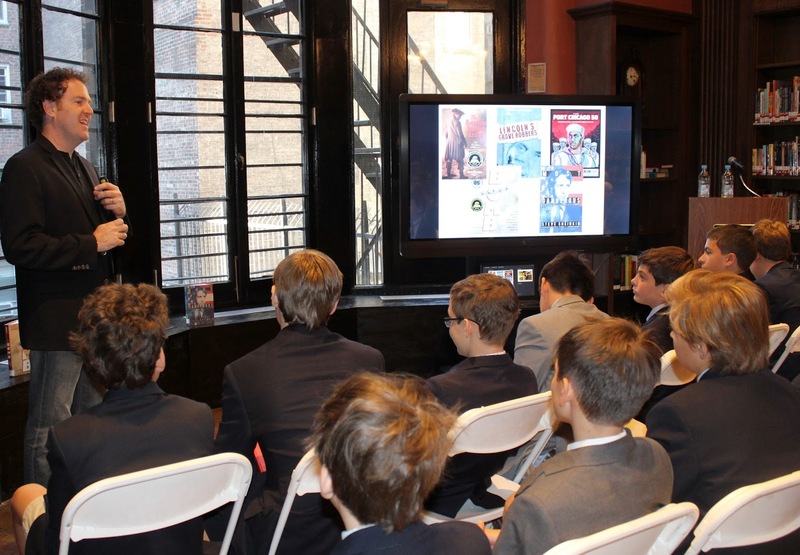 I am sure that this session with Mr. Sheinkin has sparked the curiosity of several of our boys into exploring compelling true stories of history, and perhaps even writing some of their own. 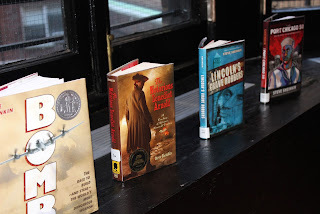 Our appreciation to the Saint David's Parents Association Author Series Committee for organizing these invaluable opportunities for our boys to interact with notable authors. Excavation of Graham House has moved sub grade with a full court press now on the removal of the old 1890 foundation walls. The setting of new footings for the rear of the new superstructure is planned to begin next week. Following the setting of new footings, the rear superstructure will begin to take shape and the demolition will move to the 89th Street (north) portion of Graham House. is now below grade on the rear (south) portion. Foundation wall removal. Pictured: south foundation wall. Project looking north. School townhouses to the left, Graham to the right. 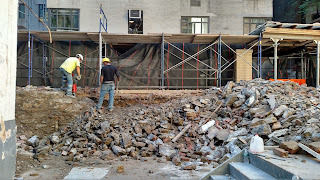 All that's left of Graham House is the 89th Street (north) portion along the front. 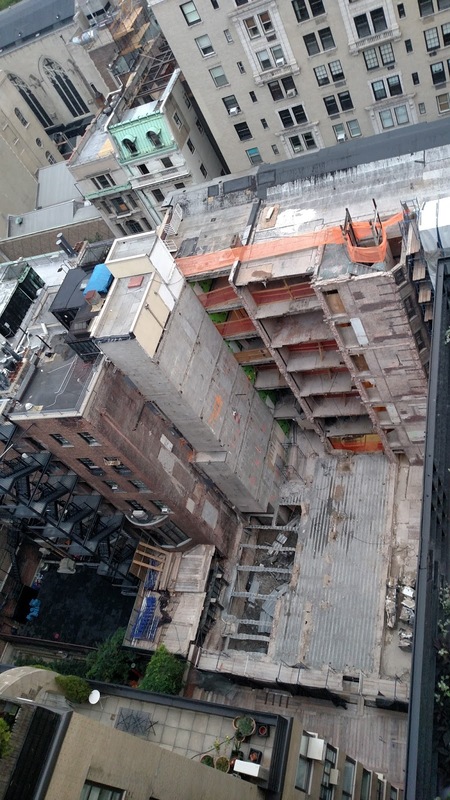 The entire rear (south) portion is gone. 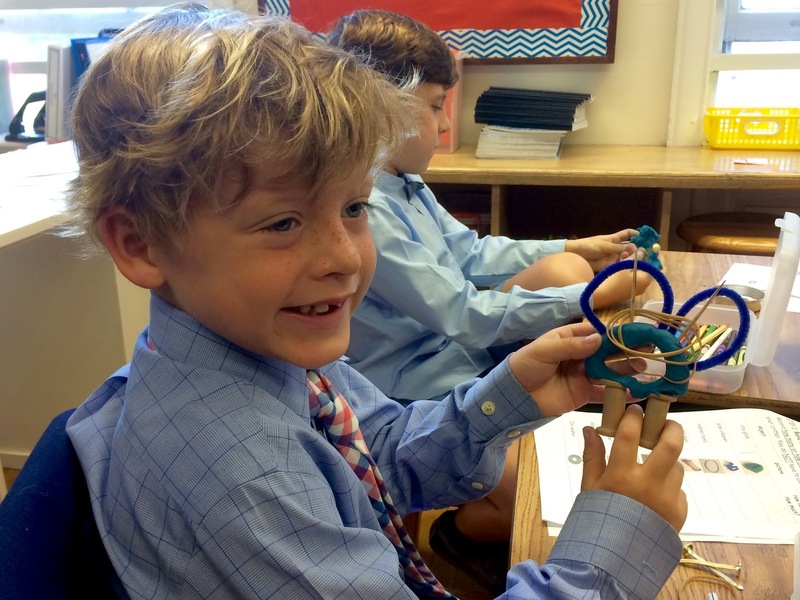 In the spirit of scientists and engineers our boys in the second grade have been active in a STEAM unit designed to help NASA. First as scientists, the boys explored objects and substances, making observations and asking questions that get at the essence of what makes these items unique. They learned to use scientific measurement tools to measure properties and to record their data. Next, the boys were engineers tasked with designing and building mascots for NASA that will keep astronauts company during (hypothetical) extended space travel. The mascot must have a mass of exactly 173 grams to ensure optimal balance of the spacecraft during launch. Boys were given an assortment of materials. They worked with triple-bean balances to measure and record the mass of each component, employing mathematical reasoning to add, subtract, and combine components to meet the mass specification while using their aesthetic sense to optimize their mascot’s ability to warm hearts in deep space. "The mass of each thing adds up to 141 grams, so we will have to use more than one of each object." "Our clay is 110 grams. A washer is about 30 grams. If we use clay and two washers we'll be close to the goal." "Tooth picks are very light, but they are also very stiff and strong. I can use a lot of them to make strong legs that will support my mascot." "Before we started to design our mascot, we put all of the materials on the scale and added pieces until the total mass was 173 grams. 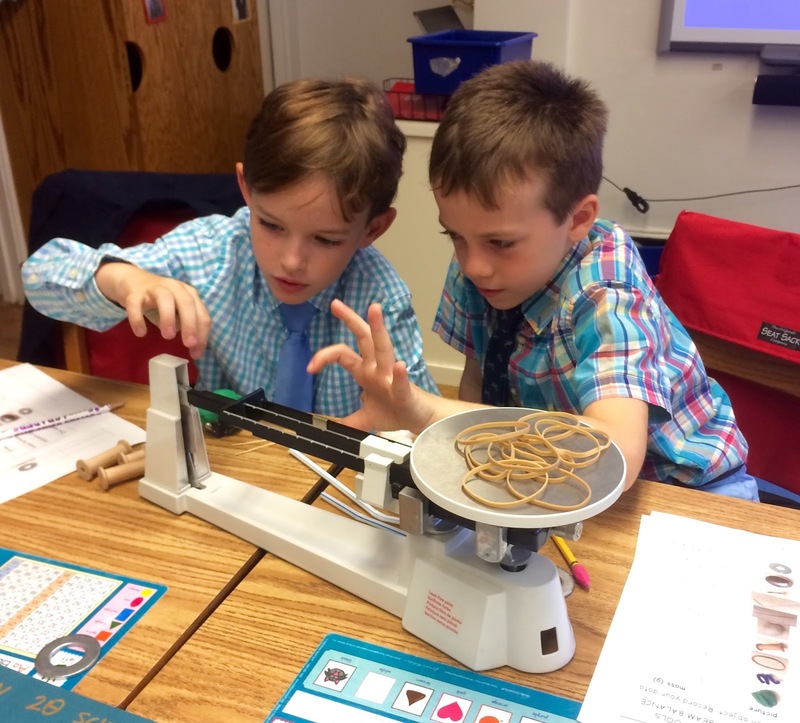 We know that if we use all of those things, our mascot will be 173 grams total." This unit is a great example of the interdisciplinary nature of STEAM projects, and the ways they engage our boys curiosity and imagination to meet challenges. 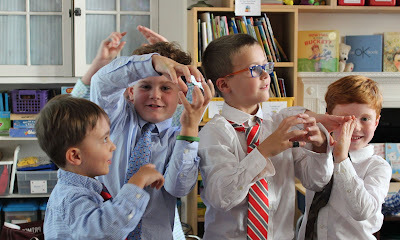 Today, first graders sang songs in Spanish and danced around the classroom as they acted out being a variety of shapes, reciting their number of sides. 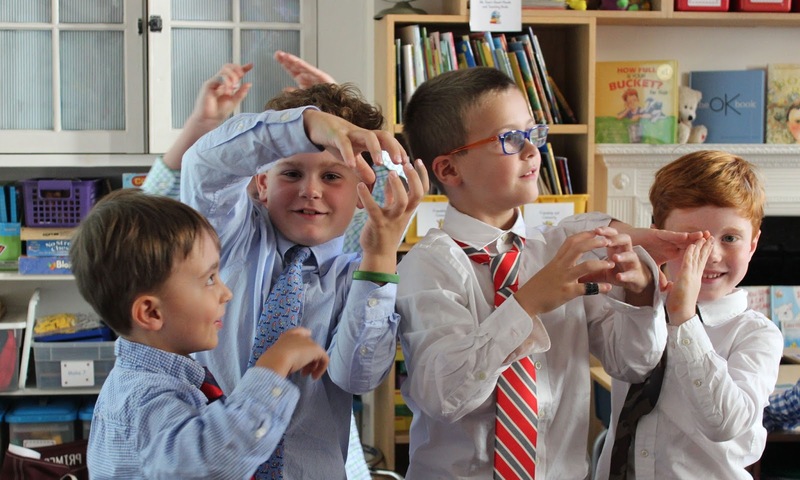 For several days each week our boys learn Spanish and experience cultures of the Spanish speaking world through Saint David's school-wide Spanish immersion program. The program uses visual, musical and kinesthetic activities to help our younger boys deepen their understanding of the language. 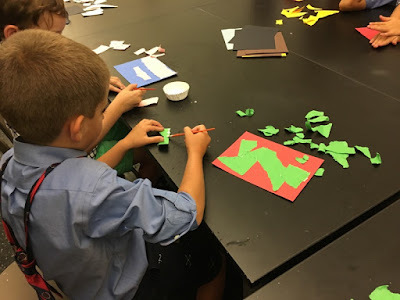 Today our second graders and their art teachers began an exciting new unit done through our partnership with the Guggenheim, right down the block from Saint David's. 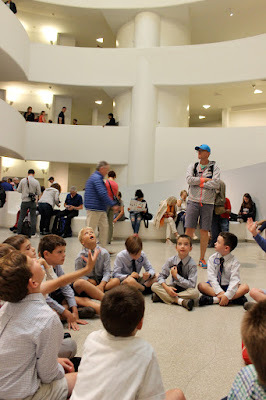 Led by a museum educator, the boys first gathered in the rotunda of this architectural wonder and talked about the various shapes they could see within the museum, as well as how Francis Lloyd Wright was inspired by his love of nature. When asked to comment about the shape of the building itself, boys said it brought to mind "a snake coil," an "upside down ice cream cone," and "tornadoes." They then viewed Piet Mondrian's Dune in Zeeland, discussing how this work was done exclusively in two colors, and they examined the edges where the orange and blue meet. 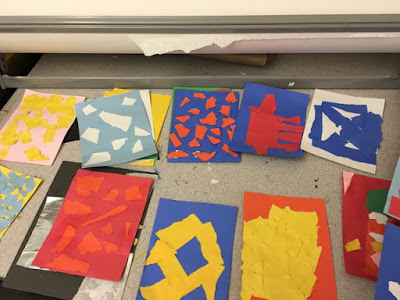 Afterward, the boys moved to the art studio where they explored the relationship between color and shape, creating their own two-color collages by combining large and small shapes of torn paper. This was the first of 10 sessions at the Guggenheim; the last will be a final exhibit of the boys' artwork. Partnerships like this enable boys to be exposed to teachers beyond the classroom, which promotes a different type of questioning and intellectual curiosity. 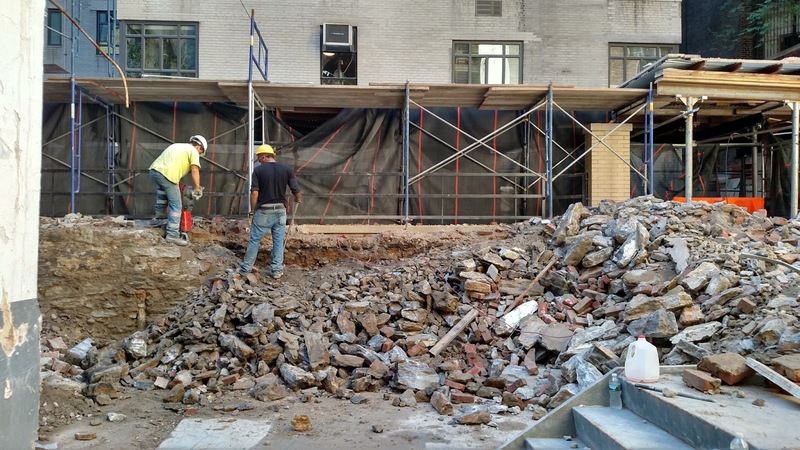 As the first days of school arrived, demolition of Graham House moved underground. 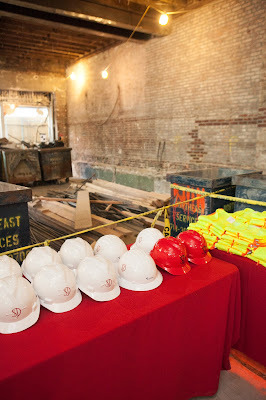 As you can see in the photos below we have broken through the floor of the back of Graham. 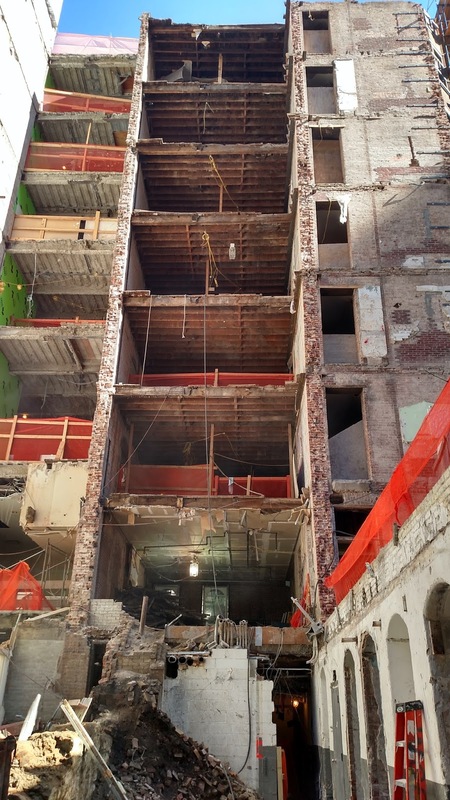 Once complete, new footings will be set, then all attention moves to the front of Graham and the easier and quicker demolition of the remaining floors in front. 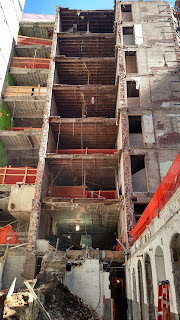 Two of these front floors have already been demolished and the new steel inserted. Day One. One of my favorites. The excitement on the boys' and parents' faces as they approach 12 East 89th Street--this year from the west--was energizing. There's a lot of change afoot at Saint David's, as we stretch our school bigger and better than ever. What doesn't change is that eager anticipation that sparkles in the eye of a boy as he meets his teachers and reconnects with his classmates after a fun summer, the commitment we have to our mission, or the caliber of the teaching and learning at this great "littler" school. ...the brink of a new age. 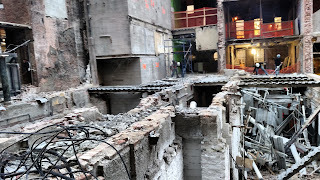 As I write this letter for the Magazine, the walls of the old are literally coming down and the foundations of the new are being laid on its bones...and it’s not the first time. 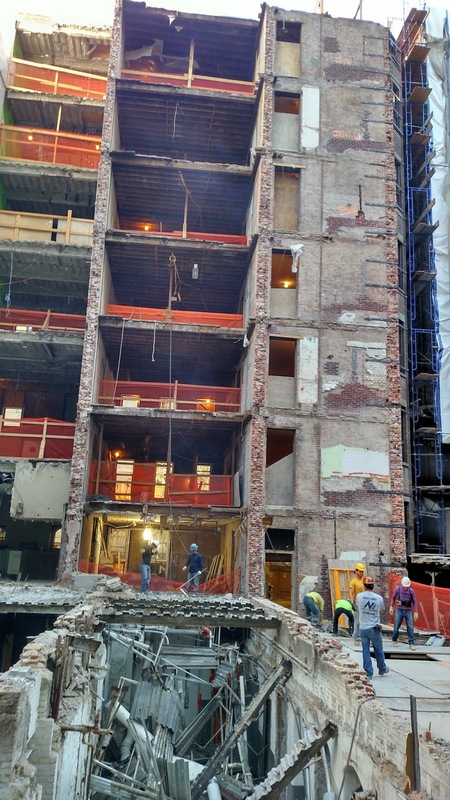 In 1953 after the school purchased 14 East 89th Street from the Cutting family, the second of the Delano and Aldrich townhouses, then Headmaster David Hume, with a group of hearty boys, took sledgehammers to the dividing wall. Their breakthrough officially initiated the first great expansion of Saint David’s. 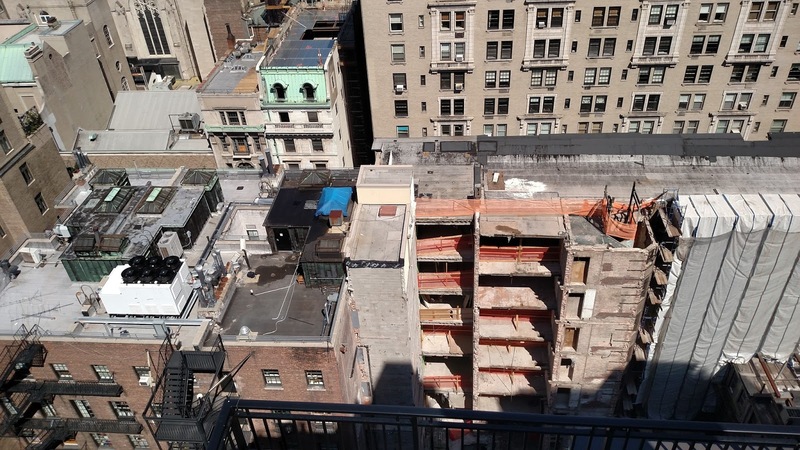 Since then, the school has continued an eastward migration with large scale acquisitions — in 1963 of 16 East 89th, the last of the Cutting family homes, and in 1972 of Graham House — that have taken the school from mid block 89th Street all the way to Madison Avenue. On the rather beautiful Thursday afternoon of June 2nd, four boys and I took large sledgehammers to the wall that divides 16 East 89th Street from Graham House. More than 40 years in the making, this breakthrough officially initiated our next great expansion. 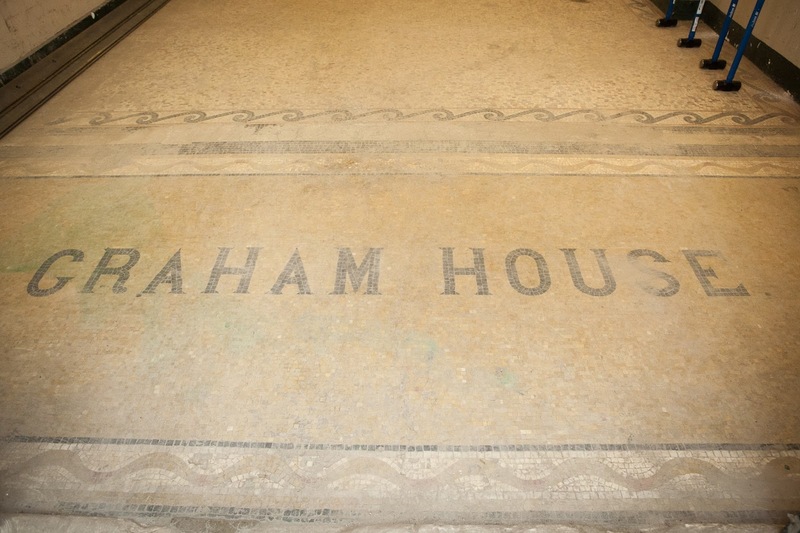 What’s new for us is not for Graham House, which has experienced nothing but change for the better part of its 125 years. Built in 1891 by Thomas Graham, The Graham was the first residential apartment hotel built on the East Side. Considered at the time to be a massive building, its seven stories were made of Indiana limestone and Pompeian brick. It sat on the crest of Prospect Hill surrounded by trees and open farmland, some 30 blocks north of the last cluster of large buildings at the southern edge of Central Park. The hotel boasted views of the “Hudson Valley to the North with Washington Heights beyond.”(1) Its location in the middle of nowhere, hard to imagine today, wasn’t its only problem. It was also around this time that Thomas’ father and old building partner Charles Graham died. “Like most men of intelligence and resolution, Mr. Charles Graham had strong convictions on political matters, and during the early days of the Civil War he devoted himself earnestly to the cause of the slaves, many of whom he secretly assisted to freedom, while he defended them in public through the columns of the Tribune.”5 I can imagine many of the properties Thomas’ father built serving as weigh stations on the Underground Railroad. In keeping with classic Graham tradition, during WWI the Brunswick served as a Veterans hospital, taking care of the wounds of war. Right around the time of the Great Depression, it made its transition to an apartment complex and became the Graham House we know today. 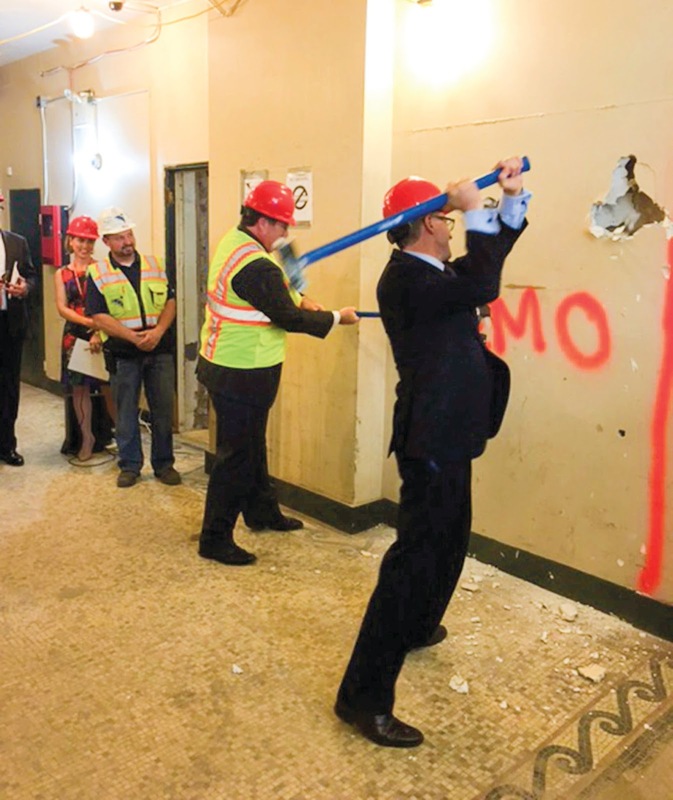 For the past decade Saint David’s School has been strategically preparing The Graham for its next phase. With the help of many generous, selfless people listed in the pages that follow we have made it to groundbreaking. There are a few I’d like to recognize in particular: Expansion Chairs John Menz and Craig Wood, and more recently Frankie Campione, Alex Carey ’82, and Kevin Hayden, and their team, who steered the logistics from initial concept through the design phase to approvals, permitting, and now construction; Overall Campaign Chairs Jenny Price and Greg Hoogkamp and their team, led most recently by Jeanine and Lou Salvatore, who raised and continue to raise the necessary capital; Legal Chairs Charlie Platt and Mark Shelton who guided us through myriad legal complexities, not least of which was the successful relocation of all Graham House tenants; Finance Chair Mike Marocco and his team; and our successive Board Chairs Gene Williams, Marc Robert ’74, and Dan Connolly ’77, who helped us all stay the course with their unique combination of singular focus, strength of character, and bold action. Although we have a way to go — more to raise and more to build — we are excited to finally be here. It’s no accident that our Magazine’s cover, illustrated by alum Vincent Ricasio ’92, depicts our boys working on The Graham’s next incarnation. 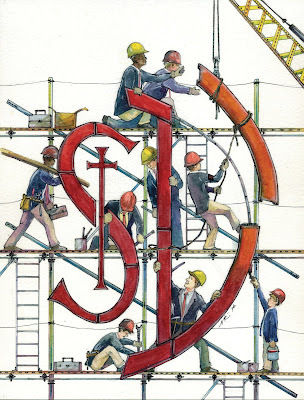 We see them applying the finishing touches to the school’s logo — hoisting the last piece of structural steel before bolting it in place to complete the big ‘D’ and painting it Saint David’s Red. They are forging the new bones of their cherished school. It’s a metaphor, of course, but it’s one we can stretch beyond the blueprints of our great expansion. As an educational community, what we are doing here is building from the bones of ‘the old,’ not on them. It’s the boys of Saint David’s — past, present, and future — who carry within their bones the mission and values that have shaped them as young men, who have always formed the bedrock of this school. And so, as The Graham reincarnates itself once again, it is with nothing less than ‘earnestness’ and ‘sincerity’ that we will soon reopen her front door and populate her halls. Her facade will be unchanged, but her bones will live anew: this time with the sounds and signs of little boys learning, growing, and changing. Exciting news regarding Saint David's eighth grader Evan '17, who discovered the game of backgammon over the summer, reading books on the game and playing regularly with his dad. He did so well and enjoyed the game so much, he entered the 41st World Backgammon Championships in Monte Carlo a few weeks ago, and placed second overall in the Juniors division. Evan's competitors were from Russia, Turkey, Israel, France, England, Switzerland, Japan and Germany. 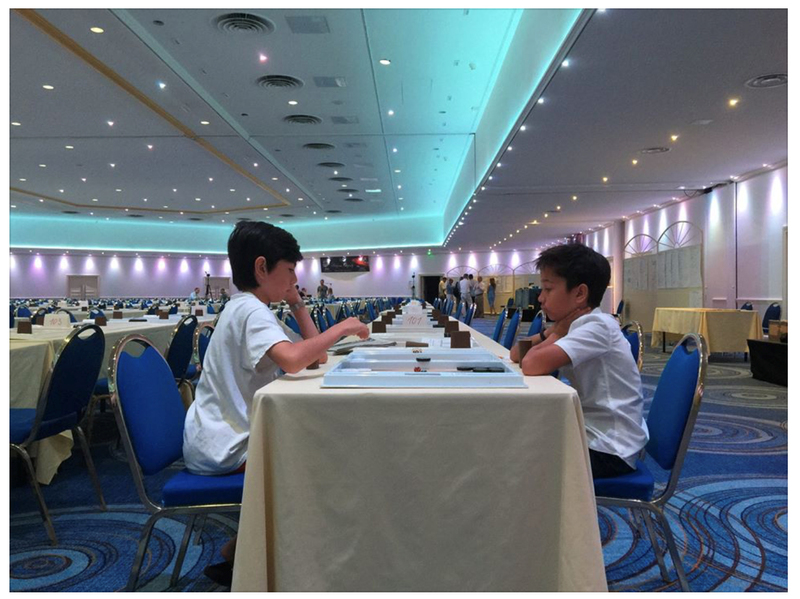 The photo, from the US Backgammon Federation website, shows the final match with Evan on the left. His dad told me that Evan wore his favorite pair of red Saint David's shorts during the competition--for confidence, and to wave the flag of his beloved school. Congratulations! One of the things I love most about summer is how it gives all of our boys the opportunity to indulge in new talents and interests, as Evan did.